Is There Life After DAT? 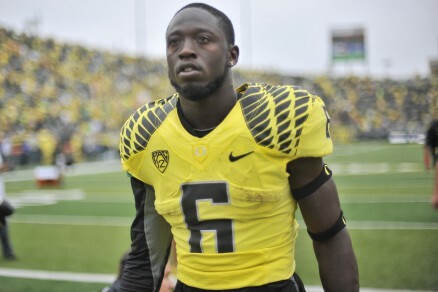 DeAnthony Thomas’ time at Oregon was like one of his scorching touchdown plays: it went by in a flash. From his first game against LSU to his final appearance (if it can be called that) against Texas, DAT was the equivalent of a human meteor. He blazed a bright trail across Oregon football that will not be forgotten soon. He was truly a one-man highlight reel. On the surface it seems that Oregon could naturally take a step back in performance without him in the lineup, but that may not be the case. Despite his amazing explosion plays, Thomas was never going to be the kind of player who played every down. It was a strange thing about him as a player — hugely talented, built like a wide-receiver, born with a running back’s mentality, but not really made for the long-term abuse a back must endure. When Thomas went down with an ankle injury against Cal, quite a few experts predicted that the Ducks would falter without him, but Byron Marshall and Thomas Tyner did an excellent job of displaying the envious wealth of talent the Oregon program had at the position. The Ducks went on to prove the pundits wrong by continuing their offensive efficiency. Now he is gone for good, off to the green pastures of the NFL, and may fortune smile upon him as a professional. Oregon moves on. Byron Marshall will most likely be the starting running back after rushing for more than a thousand yards (despite missing a game). Thomas Tyner may also have a thing or two to say about who is the starter. Behind that potent 1-2 punch are a bunch of talented youngsters who will also have an opportunity to get some playing time. The glut of running back affluence continues for the Ducks. 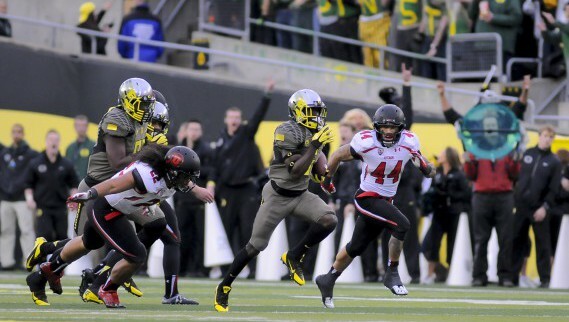 Despite losing Thomas’ big-play ability, Oregon has more than enough weapons to remain potent. Marshall and Tyner are the type of players who can play every down, who have a similar ability to get to the end zone and explode for huge yards. No one can really replace the home run ability of Thomas, but that’s the thing — they don’t need to. Oregon doesn’t need to score a touchdown on every play, and with Marshall and Tyner grinding out yards and scoring points, they have the type of players that will allow them to slow the game down when necessary, such as at the end of close games. The Ducks were never able to do that with DeAnthony, and they will be better off when they can. Oregon returns a ton of players on offense. They will be experienced, hungry and more knowledgeable than ever before. Marcus Mariota ought to have a bit of a chip on his shoulder after the national press snubbing he received at the end of the year. The 2013 season, despite its relatively happy ending, should have left a bad taste in the collective mouths of these Oregon players. They wanted more, they expected more, and they failed to meet their own lofty goals. With this offensive group returning, the Ducks should be as powerful, as decisive and as explosive as they have ever been — despite losing Thomas and Josh Huff. Any complacency that was witnessed during the end of the year should be gone, replaced by a stark hunger to win. Nothing will be handed to Oregon, and these players really know that. The Ducks will be just fine without DeAnthony. They may even be better.